When winter rain washes away Mary’s chances for a sledding day, she thinks there is no hope for excitement. But with a little imagination and a brimming pantry she soon finds herself caught up in a colorful journey. Together with her father she relives five Alaska adventures, each uniquely inspired by a jar in her pantry. From salmon to blueberries, each lively tale introduces young readers to Mary’s homeland and invites them to learn about how different places can produce different foods. 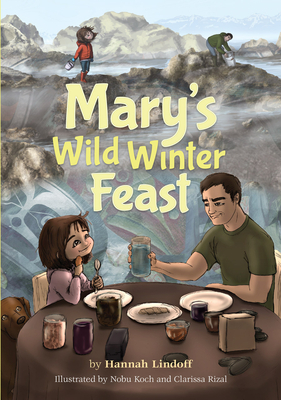 Featuring brilliant collages from artists Nobu Koch and Clarissa Rizal, Mary’s Wild Winter Feast is a celebration of food, family, and finding fun in unexpected places. A lifelong Alaskan, Hannah Lindoff is a strategic advisor for the Alaska Seafood Marketing Institute. A member of the Tlingit Raven T'ak Dein Taan Clan, she lives with her family in Juneau, Alaska, and in the small village of Hoonah. "A heartfelt evocation of the importance of place and family."